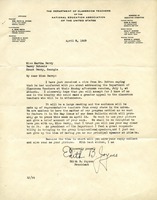 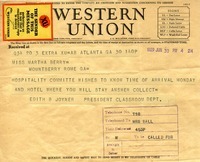 Telegram to Martha Berry from Edith B. Joyner requesting to know the time of Martha Berry's arrival and where she will be staying. 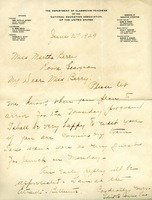 Edith B. Joynes asks when Miss Berry will be arriving for the Monday meeting, and offers to meet her train and take her to lunch. 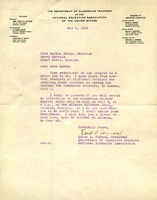 She closes the letter with a request for a quick reply and informs Miss Berry of her lodgings. 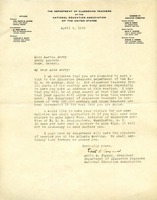 Agnes Winn sends a box of clothing to the Berry Schools. 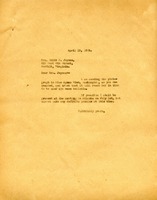 She also informs Martha Berry that Mrs. Joynes and herself will be arriving in Atlanta on Wednesday morning and hope to visit the schools on that day. 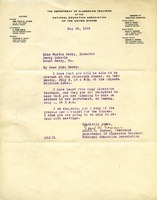 Mrs. Joynes writes to Martha about hoping to visit on June 26th.